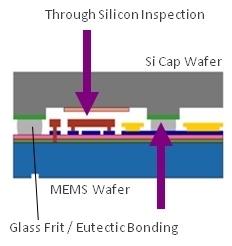 Silicon, GaAs wafers and other substrates become transparent at infrared (IR) wavelengths. High performance IR optics in combination with a high efficiency InGaAs camera provide images with superior resolution and contrast. The optics are designed and optimized for the IR range from 1050 to 1550nm including IR optimized objective lenses with selectable magnifications from 2.5x, 5x, 10x, 20x, 63x, 100x. The high resolution InGaAs-camera guarantees best image resolution and highest contrast images. The IR optimized illumination path can be switched to incident and/or transmitted light. A combination of IR & visible light inspection is supported. 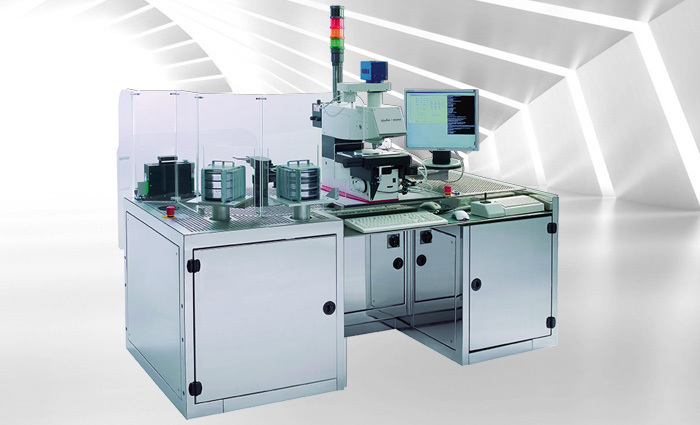 The best-in-class technology ensures worldwide leading edge performance regarding accuracy, repeatability and throughput. With the illumination source adjusted to your application requirements (1050nm - 1550nm), IRIS2100/IRIS2300 automatically detects smallest details such as bubbles and breaches that effect the functionality of the device. This advanced technology, in combination with our IR optimized software solution also detects delamination and eutectic bonding failures. IRIS2100/IRIS2300 enables you to detect and classify contamination and damages in the active device area. 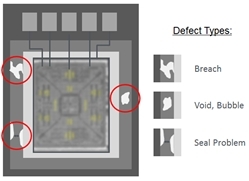 Our patented combination of visible and infrared illumination allows you to distinguish surface defects from defects deep inside the substrate. The combination of a high resolution objective lens (up to 100x) and our powerful NanoStar software solution guarantees the best available measurement accuracy with sub-micron repeatability for CD and overlay measurements. Our systems feature a unique combination of visible and infrared illumination in order to deliver optimized results for structures on the top, and the bottom, and inside the substrate.